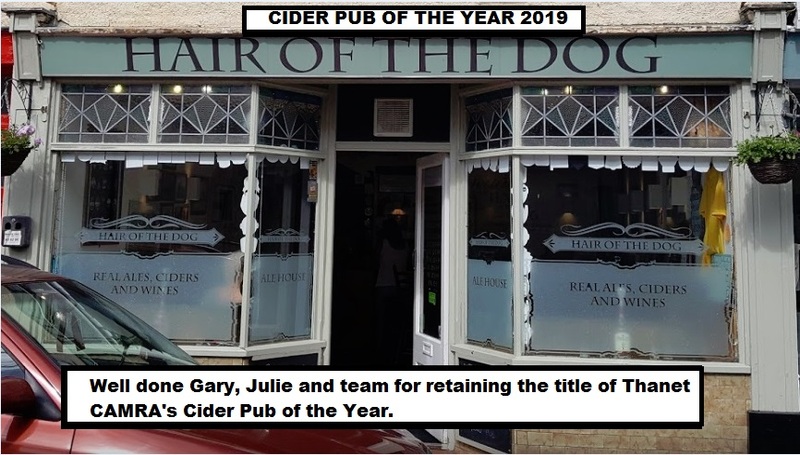 In a close fought competition Minster's Hair of the Dog held off Northwood's NauticAles to retain the Cider Pub of the Year title. They go forward to take on the rest of kent hoping to be named Regional Cider Pub of the Year. 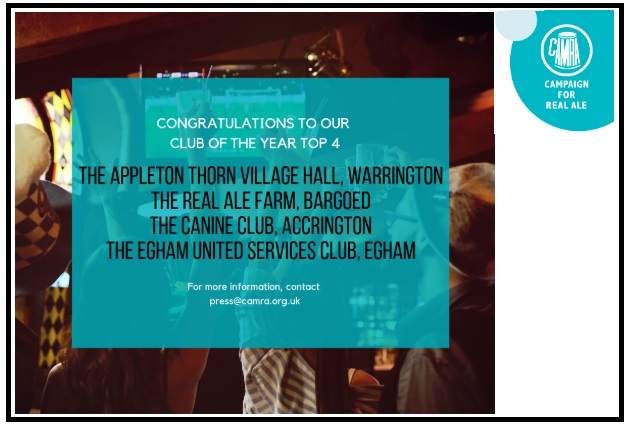 Presentation dates will be announced very soon so you acn join these two worthy Cider pubs to celebrate their success. 17 days to go until #easterbeerfest - the organising team met last night to check all items are where they should be and I am happy to report that they are....!! CATERING - Whilst we are not responsible for the catering at the venue we have seen the list the Winter Gardens will be offering during the festival and our mouths are watering already.....Beetroot, Quinoa & Red Pepper Burger and BBQ Beef Brisket amongst the options.......remember that you are not allowed to bring your own food in to the venue and by purchasing the food you will be supporting the venue in these times of austerity for council funded leisure facilities such as this. There will also be olives and cheeses available from the concessions in the quiet hall. 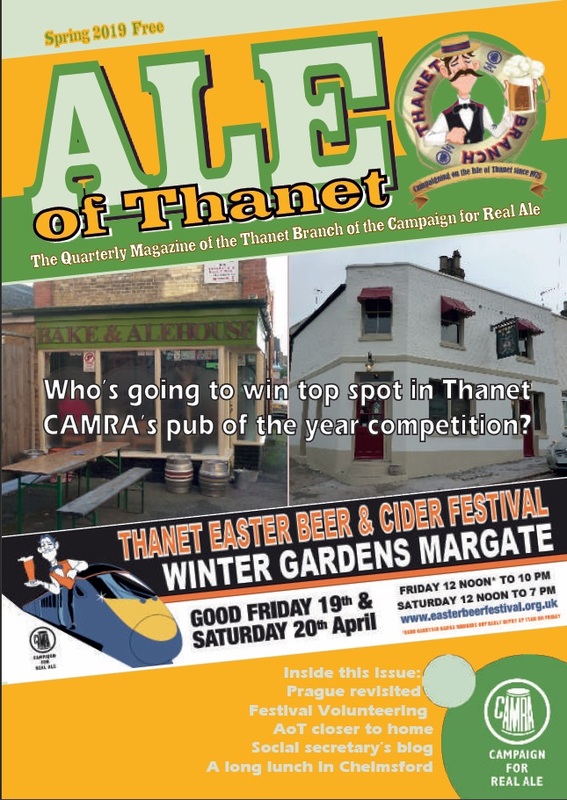 ADVERTISING - downloadable PDF poster are available on our website www.thanet-camra.org.uk - Banners are now up around Thanet - have you seen one yet?? 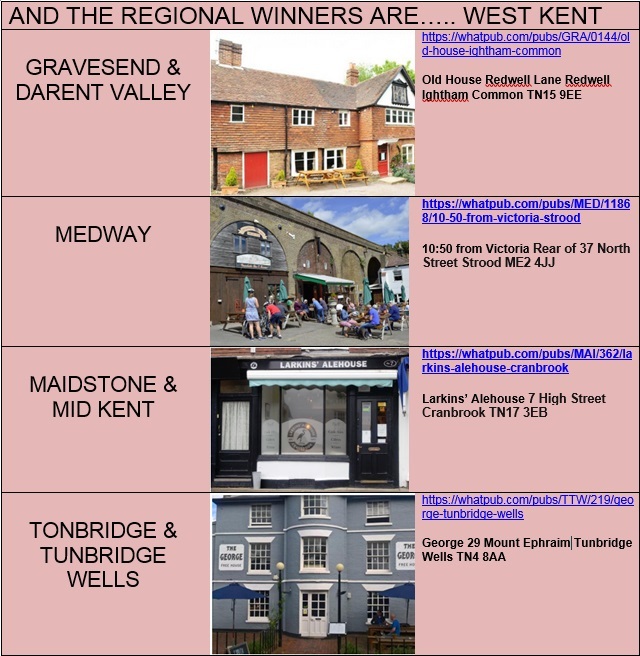 All of the above (except Bexley branch) will now split into sub-regional competitions with guest judges from the opposite area before a two pub shoot out East Kent vs West Kent to be named best in Kent. 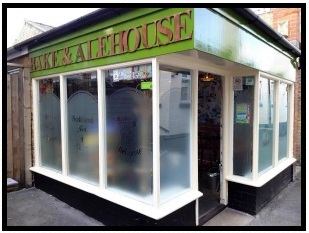 Congratulations to John at Bake & Alehouse, Westgate-on-Sea (Micro Pub of the Year 2019) and Eddie at Montefiore Arms, Ramsgate (Traditional Pub of the Year 2019) for being named the best in their category in our Pub of the Year competition. One of these two pubs has also scooped the overall prize but won't find out until the day of the presentation - how exciting....!! Check back for details of the presentations which will probably be Saturday 16th March. 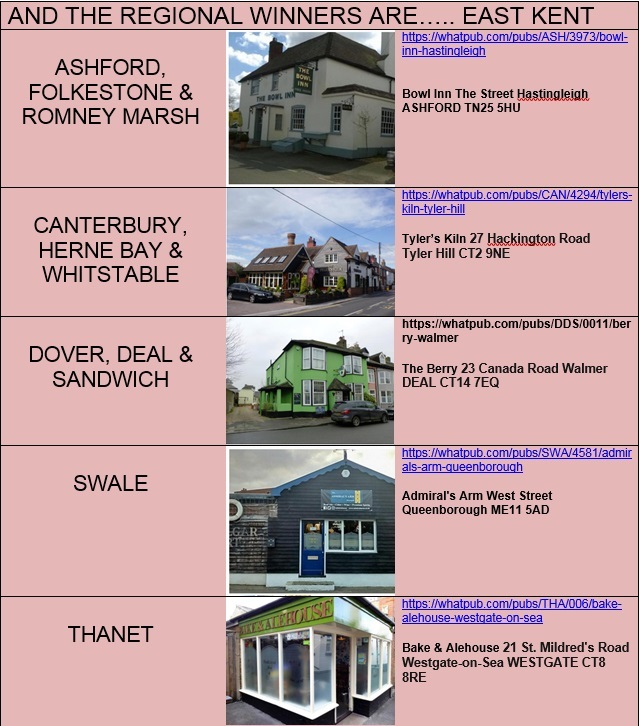 Joint runners up in the Micro Pub of the Year competition were The Hovelling Boat Inn, Ramsgate and Old Bay Alehouse, Minnis Bay. 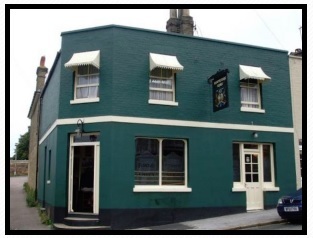 Runner up in the Traditional Pub of the Year was Banks Ale and Wine House, Cliftonville. After an amazing three years in Norwich the GBBFW will be hosted by West Midlands CAMRA in 2020, 2021 and 2022. The venue and the dates to be confirmed very soon. Well done to the team and we look forward to joining you next year. Congratulations to all the beers who made it through the nomination process, multiple beer tasting rounds to get to the final where the following were named the best of the best. If you would like any more information please CLICK HERE for contact details. 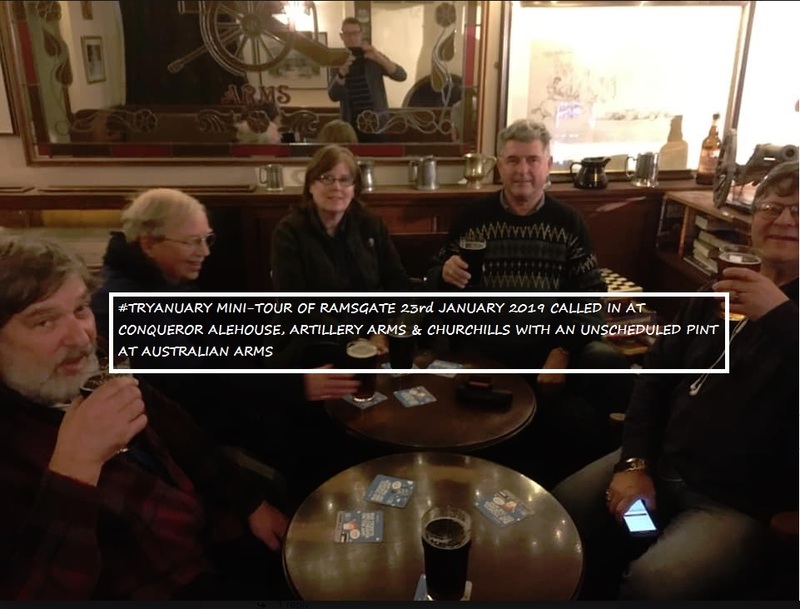 Next meeting will be Wednesday 6th March 8pm in Artillery Arms Ramsgate CLICK HERE for details. Saturday 19th January, midday at Bradstow Mill where a new committee will be formed (with some familiar faces no doubt) and the real ale and cider scene of Thanet will be discussed. All welcome to attend though only CAMRA members affiliated to Thanet branch will be eligible to vote. Hear about upcoming socials, the latest news on the beer festival (and an opportunity to volunteer...!! ), membership numbers and social media/website news. CLICK HERE to see agenda and minutes from last years. 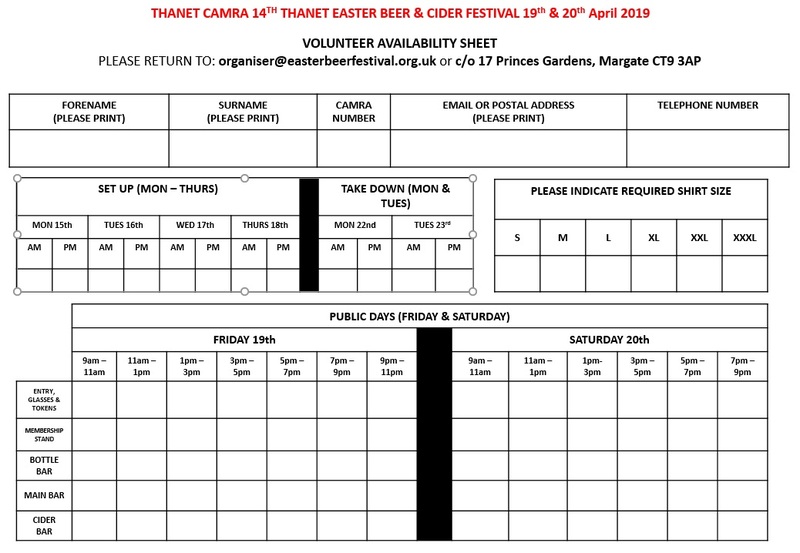 Peter, our volunteer co-ordinator, is looking for volunteers for this years Beer Festival to help with set up, the actual event and the take down. If you can spare any time he would love to hear from you. As part of TRYANUARY we yesterday visited Banks Ale and Wine House in Cliftonville (https://whatpub.com/pubs/THA/222/banks-ale-wine-house-cliftonville), Yard of Ale St Peters (https://whatpub.com/pubs/THA/189/yard-of-ale-st-peters) and White Swan Reading Street Broadstairs (https://whatpub.com/pubs/THA/103/white-swan-broadstairs). Thanks for your hospitality one and all. 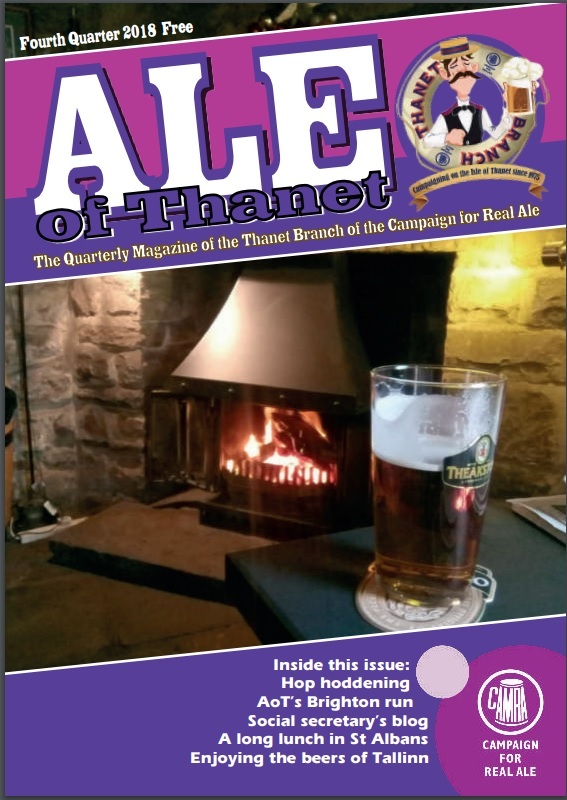 The volunteer distributors will be getting these out to your favourite watering holes as soon as they arrive from the printers so you can read yours over a pint or two. 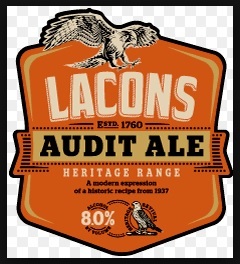 What is Real Ale - In the early 1970s CAMRA coined the term 'real ale' to make it easy for people to differentiate between the bland processed beers being pushed by the big brewers and the traditional beers whose very existence was under threat. Real ale, also referred to as cask-conditioned ale, continues to develop its wonderful tastes and aromas in the cask through a process called secondary fermentation.